can often be used to check whether the model is consistent with data. For more information about using predictive distribution as a model checking tool, see Gelman et al. ; 2004, Chapter 6 and the bibliography in that chapter. The idea is to generate replicate data from —call them , for , where M is the total number of replicates—and compare them to the observed data to see whether there are any large and systematic differences. Large discrepancies suggest a possible model misfit. One way to compare the replicate data to the observed data is to first summarize the data to some test quantities, such as the mean, standard deviation, order statistics, and so on. 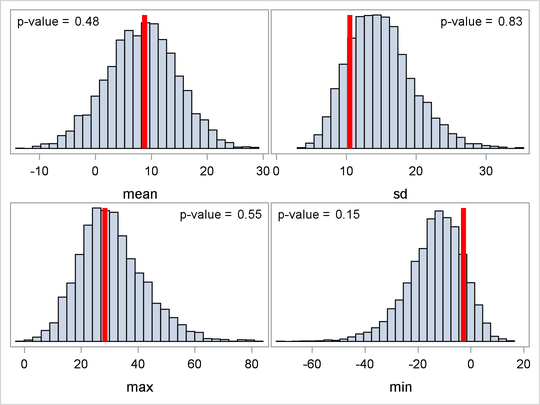 Then compute the tail-area probabilities of the test statistics (based on the observed data) with respect to the estimated posterior predictive distribution that uses the M replicate samples. The following example shows how you can use PROC MCMC to estimate this probability. The hyperprior distribution on m is a uniform prior on the real axis, and the hyperprior distribution on v is a uniform prior from 0 to infinity. The following statements fit a normal mixed model and use the PREDDIST statement to generate draws from the posterior predictive distribution. The ODS LISTING CLOSE statement disables the listing output because you are primarily interested in the samples of the predictive distribution. The HYPER , PRIOR , and MODEL statements specify the Bayesian model of interest. The PREDDIST statement generates samples from the posterior predictive distribution and stores the samples in the Pout data set. The predictive variables are named effect_1, , effect_8. When no COVARIATES option is specified, the covariates in the original input data set SAT are used in the prediction. The NSIM= option specifies the number of predictive simulation iterations. The following statements use the Pout data set to calculate the four test quantities of interest: the average (mean), the sample standard deviation (sd), the maximum effect (max), and the minimum effect (min). The output is stored in the Pred data set. The following statements compute the corresponding test statistics, the mean, standard deviation, and the minimum and maximum statistics on the real data and store them in macro variables. You then calculate the tail-area probabilities by counting the number of samples in the data set Pred that are greater than the observed test statistics based on the real data. You call PROC SGRENDER to create the graph, which is shown in Figure 73.21. (See the SGRENDER procedure in the SAS ODS Graphics: Procedures Guide.) There are no extreme p-values observed; this supports the notion that the predicted results are similar to the actual observations and that the model fits the data. and the distribution is not conditional on observed data.